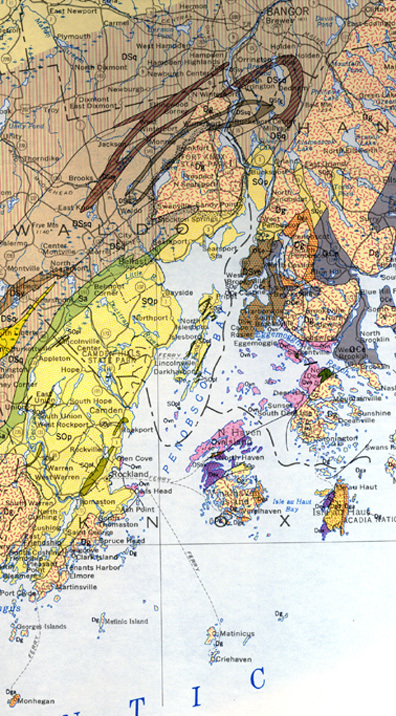 Preliminary Geological Map of Maine, showing soil and rock types. Note especially the avacado green line that extends from Thomaston almost to Camden; that is limestone. Also, the pink with red flecks on the map shows where there is granite. Note the granite from St. George, across Penobscot Bay to the southern part of Vinalhaven, on to the Stonington area. 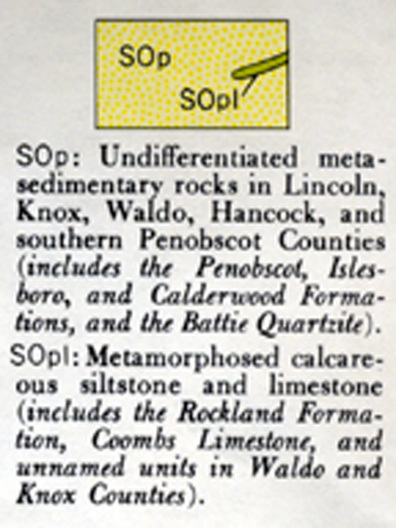 Also, there are significant granite resources in northern Penobscot Bay, where there were quarries in the Mt. Waldo area of Frankfort. This map, based on a map from the Maine GIS Library, shows major towns and islands in Penobscot Bay. Yellow on the west side of the Bay shows the approximate location of lime deposits. Pinkish tan shows granite quarrying areas, both along the southern part of the Bay and also in Frankfort. 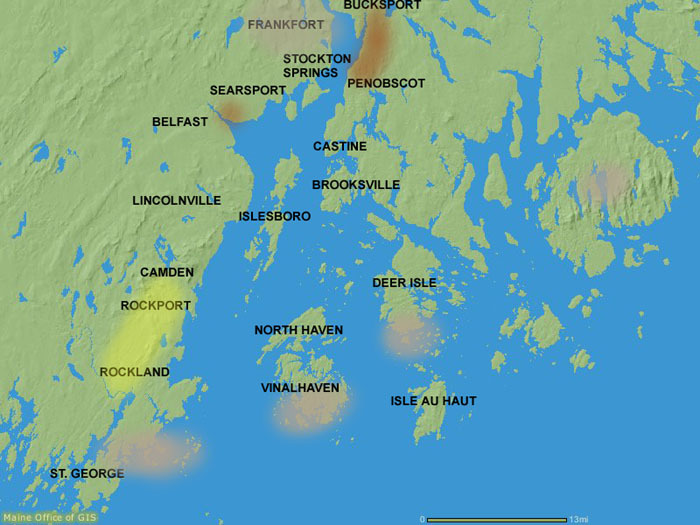 Reddish-brown depicts the location of some of Penobscot Bay's brick industry. 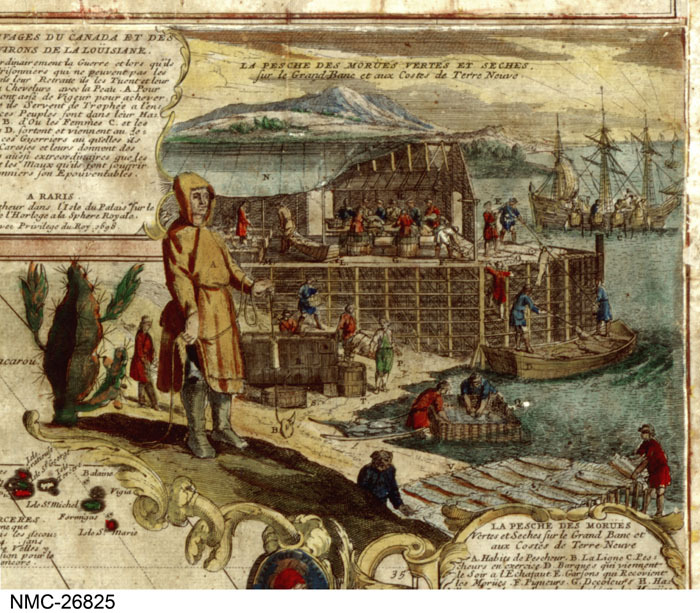 More brickmaking occurred upriver in Orrington and Brewer, on the east side of Penobscot Bay. 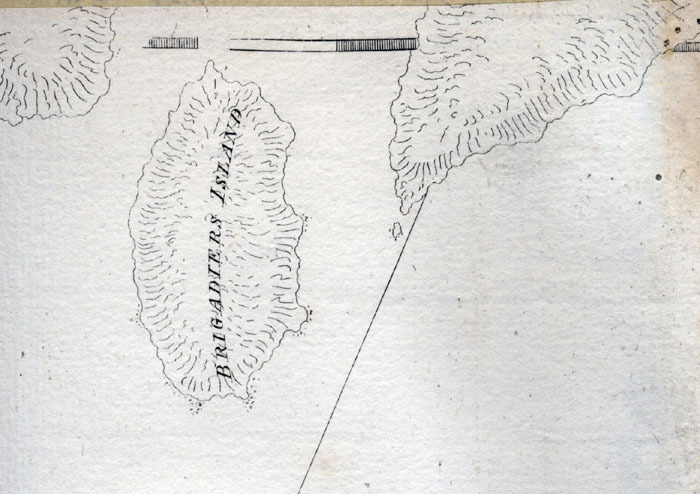 Drawn on the side of a map of America, this is the only existing image of a Newfoundland cod fishing station. From the days of Cabot and perhaps before, fleets of European fishermen sailed to the banks, and they soon discovered that they could stay longer and bring back more fish if they set up shore stations to split, salt and dry the catch. Some of these men may have overwintered. This would have been an early source for Americans to have gotten trade goods from the Europeans. Brigadier's Island is now called Sears Island. It is in Searsport and is the largest undeveloped island on the Maine coast. It was the site of trouble against proprietor Henry Knox in the early 1800s. A causeway now links it to the main land. From J.F.W.DesBarres atlas The Atlantic Neptune of 1770. 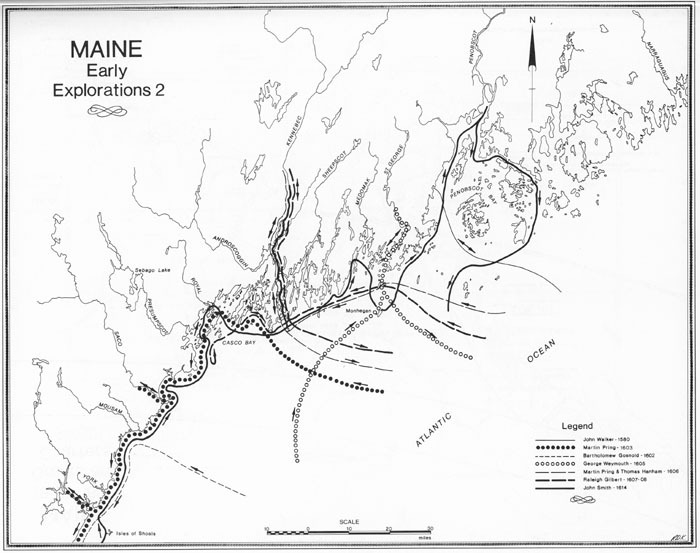 The Bagaduce River and Penobscot Bay around what is now Castine is where the Penobscot Expedition attempted to capture the British fortifications in 1779. The attempt failed miserably, and the effort is considered by many to be the worst naval disaster in American history up to the bombing of Pearl Harbor. This image is from J.F.W. DesBarres atlas Atlantic Neptune of 1770. 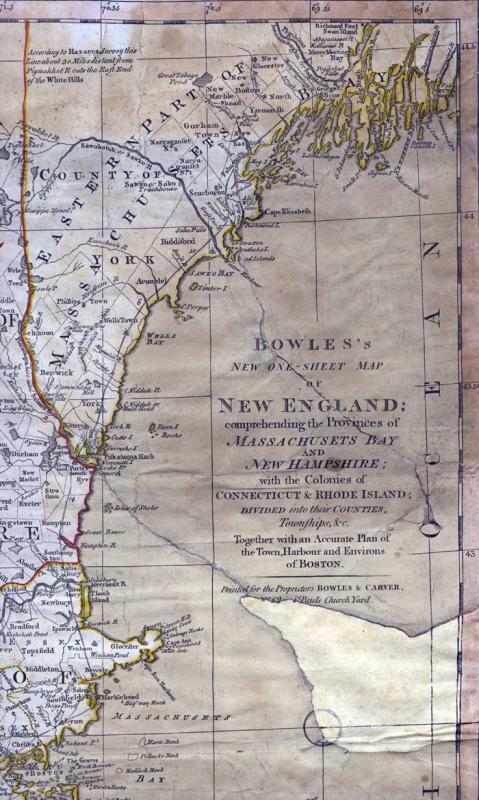 Bowles' New One-Sheet Map of New England, Boston, was based on well-known British cartographer Thomas Jeffery's Map of the Most Inhabited Part of New England which appeared in various editions from 1744 to 1755. This one sheet reduction of Jeffery's map dates to about 1765. 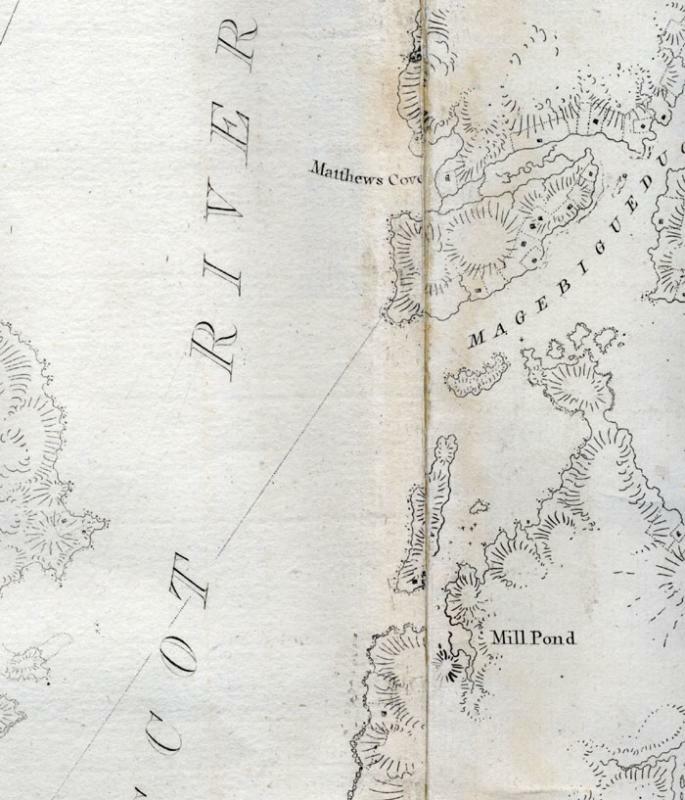 The Osher Map Library of the University of Southern Maine has a web based exhibit on the work of Jeffery, whose maps were critical to the American Revolution. 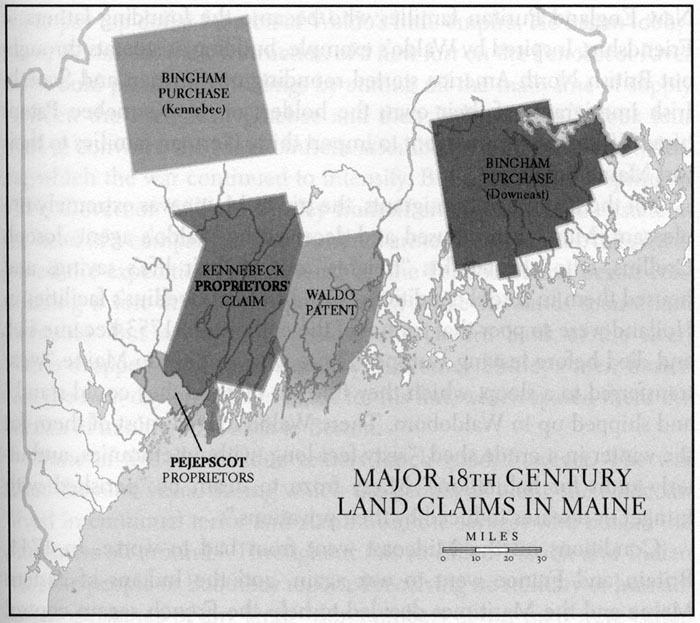 The major 18th century land claims in Maine. From the book The Lobster Coast: Rebels, Rusticators, and the Struggle for a Forgotten Frontier by Colin Woodard, published by Viking in 2004. Map drawn by Jojo Gragasin. Map used by permission of the author. 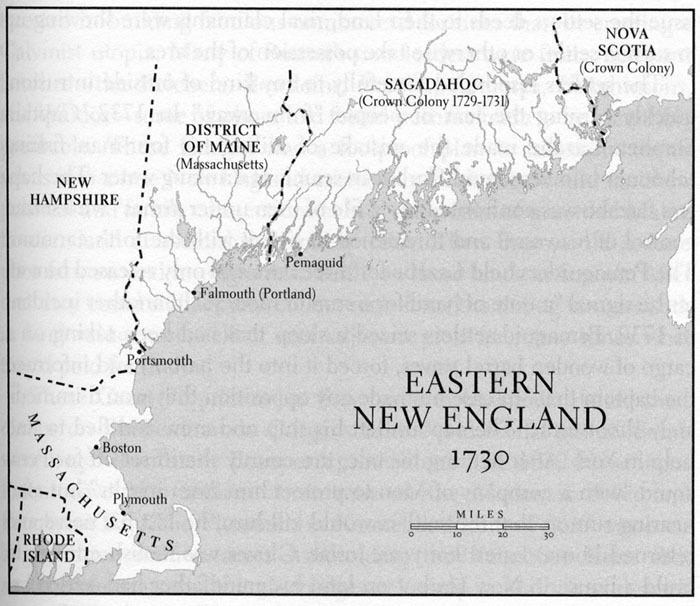 Eastern New England in 1730 shows Sagahadoc and Nova Scotia as Crown Colonies. 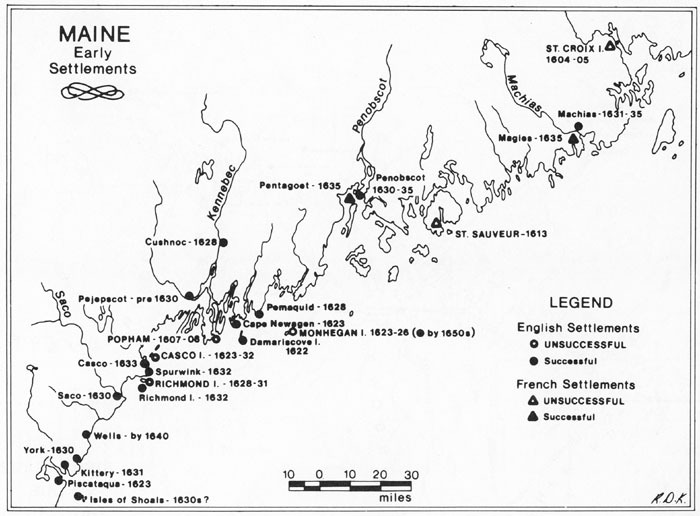 17th century settlements along the Maine Coast from St. Croix in 1604 to Wells in 1640. Map of early European exploration along the Maine Coast. This map shows the routes of Walker in 1500, Pring in 1603, Waymouth in 1605, Pring and Hanham in 1606, Raleigh Gilbert in 1607-08 and John Smith in 1614. Recent research indicates that Waymouth is likely to have gone up Penobscot Bay and River to Bangor.